Charlie Wysocki took the field at Maryland Stadium on Oct. 20, 2012, and reveled in the cheers he thought would have fizzled out a long time ago. The Terps had lost their homecoming contest against North Carolina State, 20-18. But Wysocki was celebrating a homecoming of his own that day. 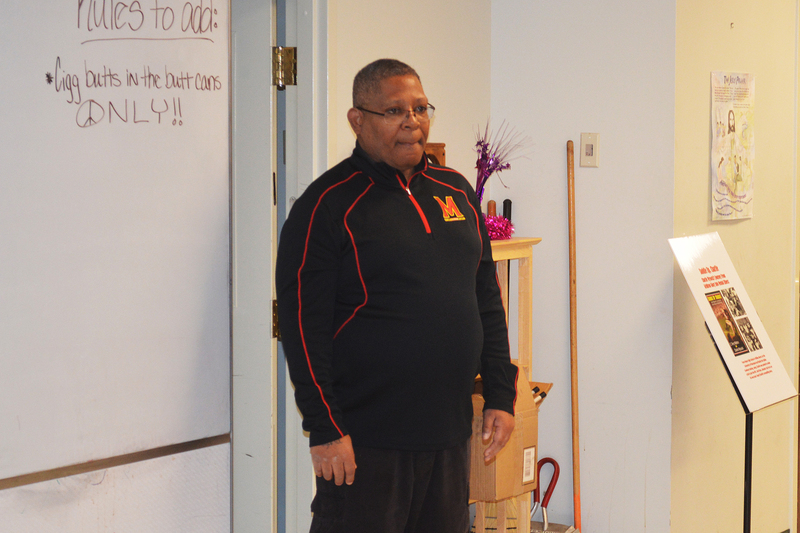 After a 30-year hiatus, the former Terrapins football star was being welcomed back to campus as an honorary captain. With a booming voice, the announcer heralded Wysocki’s accomplishments in a Terps uniform: eight 100-yard rushing games in a single season, two 200-yard rushing games in a single season and the second most career rushing yards with 3,317. But for Wysocki, those records were a lifetime away. After leaving Maryland and going unselected in the 1982 NFL draft, Wysocki was diagnosed with bipolar disorder. He would spend the next 27 years in and out of hospitals and living in the streets. Now, with the guidance of former teammates Dave Pacella and Dr. Mark Sobel, Wysocki has been out of the hospital for 3 1/2 years and is sharing his story to raise awareness about mental illness. Medical intervention, psychiatric counseling and a strong support system help stabilize Wysocki so he can live a relatively normal life and attend social events. Still, the scars of Wysocki’s embattled recovery from mental illness show. His hands – once entrusted with the football on third down – now tremble. His speech – once charismatic on and off the football field – is interrupted by the long, silent pauses he needs to gather his thoughts. Wysocki’s most recent obstacle is recovering from a life-threatening car accident on June 17 that put the former running back in the hospital with head trauma, a lacerated kidney and spleen, rib fractures, and two fractured vertebrae, said Sobel, the head of his medical management team. But despite the highs and lows of his illness and the insurmountable challenges life continues to throw at him, Wysocki owns his struggle and is using it to empower others. Born Dec. 7, 1959, as Charles DeGraffenreid in Wilkes-Barre, Pennsylvania, Wysocki was one of 14 children in a poor African-American family. His biological mother, Mary Margaret “Noon” DeGraffenreid-Wade, struggled to provide for her children as a single parent, said Terry Walters, who co-authored Wysocki’s book, and Saddle Up, Charlie: Charlie Wysocki’s Journey from Gridiron Glory Into Mental Illness. The one consistent part of Wysocki’s life was sports. To avoid getting into trouble with the law, Wysocki used football as an escape. Football would also give Wysocki a new family. In high school, he started regularly visiting the home of his teammate Steve Wysocki. Before long, Steve’s parents, Stanley and Pat Wysocki, took a liking to Charlie and officially adopted him, Walters said. Despite facing some racial adversities that came with being the adopted African-American child in a white family, Wysocki became a sports legend at Elmer L. Meyers High School in Wilkes Barre – the same high school where Notre Dame standout and NFL wide receiver Raghib Ramadian “Rocket” Ismail attended. Under Meyers football coach Mickey Gorham, Wysocki developed into one of the most recognized running backs in Pennsylvania, attracting several big-time college suitors. Suddenly, Wysocki was no longer playing football to stay out of trouble, but to see where the sport could take him. In the summer of 1976, Wysocki attended one of the University of Maryland’s football camps. It was there he first met Pacella – the man who would eventually block for him on the offensive line in college. The two Pennsylvania natives immediately clicked. Pacella recalls the only thing bigger than Wysocki’s talent on the football field was his charismatic personality. 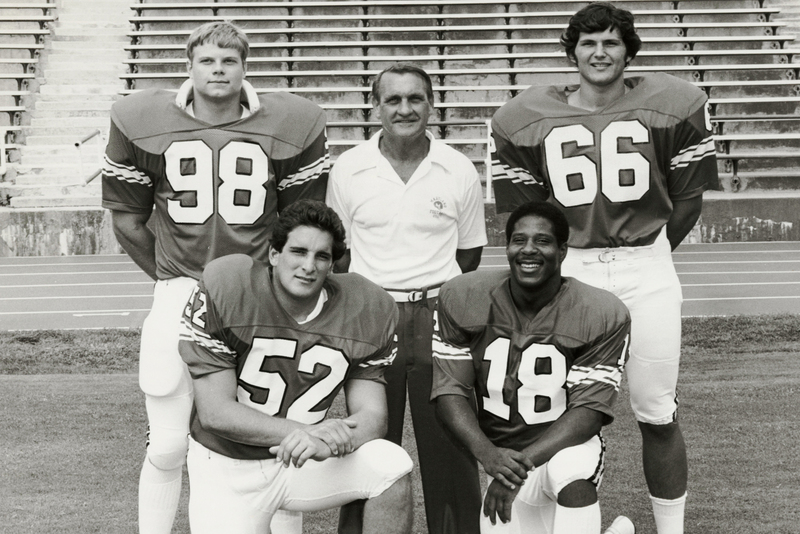 Maryland head coach Jerry Claiborne (C) poses with Maryland football players (clockwise from left) Mark Duda (No. 98), Vince Tomasetti (No. 52), Charlie Wysocki (No. 18), and Ron Solt (No. 66). But football wasn’t Wysocki’s only athletic gift. When he wasn’t breaking tackles on the gridiron, Wysocki was winning state championships on the wrestling mat and burning the competition on the track. “Charlie was not only an outstanding football player, but an outstanding wrestler as well,” Pacella said. The burning question was: Where would Wysocki’s three-sport stardom land him? For Pacella that answer came when the two reconnected at a Pennsylvania state wrestling tournament. Wysocki sported a Maryland football T-shirt, the same one Pacella had. The two would be Terrapins together. Even at the collegiate level, Wysocki was a student of the game. He transitioned seamlessly into coach Jerry Claiborne’s offensive system because of an intense work ethic that had carried over from high school. “He just had a way about his work ethic and it was contagious,” Sobel said. In 1979, Wysocki won the starting running back position as a sophomore and began to script his legendary career at Maryland. Wysocki reached the 1,000-yard rushing mark each of his sophomore and junior seasons, toppling record after record against some of the best defensive players in the ACC. In his senior year, Wysocki was considered a candidate for the Heisman Trophy and Cincinnati Bengals great Boomer Esiason took the helm at quarterback for the Terps. Everything was shaping up for Wysocki to finish his college career with a storybook ending. A sprained ankle against Vanderbilt in the first game of the season sidelined Wysocki for a couple of games in 1981, Pacella said. He would come back, but only to finish the season with seven touchdowns and 715 rushing yards – just over half his total from the year before. Wysocki’s lowered production contributed to Maryland’s disappointing 4-6-1 record that season and was a factor when he went unselected in the 1982 NFL draft. Wysocki didn’t relinquish his NFL dream though and signed with the Dallas Cowboys as an undrafted free agent. But when he reported to training camp for his tryout, something wasn’t right. He felt sick and couldn’t sleep. After a week, then-coach Tom Landry cut him from the team. Wysocki returned to Maryland to finish his schooling in the fall of 1982 and signed with the USFL Washington Federals. But before he finished the semester or stepped onto the field for the Federals, Wysocki’s irritability and sleeplessness worsened, driving him to a dark place. “I got a lot of beer, and when I got a lot of beer I tried to slit my own wrists [with a broken bottle],” Wysocki said. Wysocki was hospitalized after his suicide attempt and diagnosed with bipolar disorder. That began his 27-year stint of recurring hospitalizations. He suffered from the deepest of depressions to most grandiose fantasies – both marquee symptoms of bipolar disorder. While Wysocki was battling his inner demons, most of his teammates from Maryland had lost track of him, including Pacella. Then one night in 1989, Pacella’s phone rang, startling him from the haze of a 103-degree fever. Pacella begrudgingly answered the call, astonished by the distantly familiar voice on the other end. It was Wysocki. After a few minutes, Wysocki’s nonsensical rambling was replaced by the emptiness of a dial tone. In May 2010, Pacella tracked Wysocki to a rundown Pennsylvania state care facility. But the man Pacella found wasn’t the same as the one-time Heisman Trophy candidate he remembered. Pacella took his old teammate out to eat at a local restaurant, where they talked for more than 2 1/2 hours. Wysocki’s conversation ranged from an extremely accurate portrayal of their playing days to delusions of him and Pacella owning a fried chicken franchise. It was then that Pacella resolved to help his old teammate. He just had no idea how. So he did the only thing he could think of: He took Wysocki back to Maryland. More than two years later as the 40,720 Maryland fans at the homecoming game cheered, Wysocki cracked a small smile and shakily waved his right hand, acknowledging their applause. Pacella had arranged the whole thing. He believed that Wysocki and his career deserved the recognition of honorary captain. Ex-teammates and fans alike shook Wysocki’s hand as if he was a prodigal son returning home. Wysocki was also given a jersey embroidered with his name and got to watch the game from the president’s suite. “I think Charlie said, ‘This is the greatest day of my life,’ ” Pacella recalled. But the real impact of that day was spreading the awareness of Wysocki’s story. Upon learning of Wysocki’s condition at the pregame tailgate, Sobel decided to partner with Pacella and another former teammate, Dave D’Addio, to create the Charlie Wysocki Benefit Fund. The initial goal of the fund was to raise $20,000 to pay for Wysocki’s dental implants. But after two fundraisers, the donations reached $40,000 and the extra funds were used to meet his other basic needs. Now Pacella and Sobel were at a crossroads. They sat Wysocki down in his apartment in Plymouth, Pennsylvania, and “told him if we’re going to be involved, that we were going to have his cooperation,” Sobel said. That included getting Wysocki on a more manageable treatment regimen, such as injectable medication instead of pills, a weight loss program, and regular psychiatric counseling. Wysocki agreed to let his teammates guide him into a more promising, stable chapter of his life. On Oct. 3, 2014, Wysocki’s tumultuous journey came full circle as he was inducted into the University of Maryland Athletics Hall of Fame. But he knows his illness is lifelong, so there will always be work to be done. As Wysocki has learned to manage his bipolar disorder in the 34 years since he was diagnosed, society’s perception of mental illness has also changed. “It’s looked upon differently because it’s very hard to distinguish the illness from the person,” Pacella said of mental disease. Wysocki has been a driving force in changing the stigma of mental illness by openly speaking about his story at high schools and prisons. He most recently held the inaugural Charlie D. Wysocki Football Camp on June 4 to raise awareness about mental illness. Several Pennsylvania-area high school football players worked out and showcased their skills at the camp. Pacella, who also spoke at the camp, said “you could hear a pin drop” when Wysocki told his story to the teenagers. Wysocki better than anyone knows his disorder is never going to go away, and he doesn’t sugarcoat that in his message. The system has worked against Wysocki his entire life. A troubled upbringing left him without a support system when he descended from football stardom into mental illness. Yet, somehow he overcame multiple suicide attempts, homelessness and his own demons long enough to accept the help of his teammates when it finally arrived. “I definitely feel that people who have mental illness, they should have a second chance,” Wysocki said. Even now, life continues to throw monumental challenges at Wysocki. Currently, he is recovering from the car accident that hospitalized him and his fiancee Emma Simms on June 17. Wysocki is still having trouble communicating and recently overcame a life-threatening setback in his recovery. But Sobel said he is “stable, improving daily” and is expected to make a full recovery. When Wysocki does get back on his feet, the former running back will continue to break the tackles life throws at him and try to give as many people the gift Pacella and Sobel helped him achieve – a second chance.